My answer: practice. Spend time practicing emergency preparedness skills. All the stuff in the world won’t do you a bit of good if you don’t know how to use it. Practicing emergency preparedness wasn’t always something I preached…It was something I had to learn the hard way. First, I didn’t have a pump to get the water out of my 55 gallon barrel when we needed to move many years ago. Getting that barrel empty was pretty miserable. Later, I didn’t have the solar panel I needed to make a solar light I bought work when the power was out. We used candles instead. Bummer. Another time, we didn’t have running water for a bit, and I realized that it was pretty difficult to get water from my 55 gallon barrel (downstairs) up to my kitchen sink (upstairs). After that I started storing more 5 gallon jugs with spigots. Love those! Each and every time I’ve been FORCED to use my supplies in one way or another I have learned something, and as a result I’ve changed something about how I’m preparing. So, I have started practicing emergency preparedness on purpose more often. 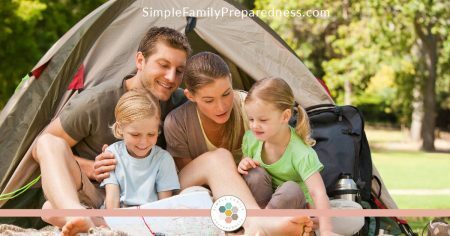 And the best time to practice emergency preparedness is in the summer because it can be fun! Camping can be such a fun family tradition. I have the best memories growing up of going camping with my immediate family, grandparents, and cousins. I now know it was a lot of work for my parents (though this post will make it easier), but the memories are so wonderful that I’m now willing to do the work myself in order to benefit my kids. Plus, it is a fantastic way to practice emergency preparedness! Practice setting up, sleeping in, and taking down your tent. Practice cooking outdoors over a fire or with a dutch oven, butane stove, or whatever “powerless” cooking tools you have. Practice filtering water from the river or lake. Practice entertaining your kids (and yourself) without electronics. Practice living without electricity and using lamps, flashlights, solar lights and more. Practice using first aid supplies (hopefully for no more than a scrape). Packing for camping will force you to look over what you have in that first aid kit just in case! Practice finding kindling and cutting your own firewood (if allowed) and then building a fire. Many of us cook outside during the summer. Barbecues with family and friends can be great fun, and they keep the temperature inside the house down. Start by using the grill you have out on the back porch, but then try something new. Can you make a pizza in your grill? Can you make bread in your grill? What other “powerless” cooking supplies can you practice using? Consider investing in a Sun Oven, Volcano Stove, Dutch oven or other outdoor cooking tool and then learn to use it! Teach your kids how to row a boat/canoe! You may also (hopefully not) have an opportunity to use your first aid supplies, so look over your kit and read through your manual! Practice safe swimming (this can also be done at the local pool). Bring your water filter and filter that lake water! This means you won’t have to bring as much water, and it will give you an opportunity to make sure you know how to use your filter before you have to. Important note – many filters have a six month shelf life once you’ve used them once, so if you do use your filter, make sure you buy a replacement (just the actual filter itself, not the plastic parts). This can be a great way to practice using a 72 hour kit (go-bag style). Do you really have what you need in there to survive for three days without help? Backpacking can also be a fantastic time to pull out those freeze dried foods and created some lightweight meals you can make by just adding water. Last, you will have to filter your own water on a backpacking trip as it simply isn’t possible to carry enough water. One fun way to rotate through your stored water is to use it for a water fight! Bring out the squirt guns, fill ’em up with the water you’ve had stored for a while, and make some memories! You might also consider turning your water off for the day and practice using that stored water to cook, bathe, wash clothes, etc. Most kids are home during the summer. Fill their time and make it fun for them to practice various emergency preparedness skills by turning them into a game. When do we call 911? You knows our full address/phone number? Where is our family meeting place? What is Dad’s phone number? What are mom’s and dad’s full names and birthdays? Where do mom and dad work? Name two ways to put out a fire. Have a race where family members try to find things on your evacuation list (to make sure they know where they are). Practice gathering everything on your evacuation list. Go get ice cream if you do it within a certain time limit. Let your kids spend some times playing the games on Ready.gov’s Be A Hero Site. Play “what if?” Create different imaginary scenarios and have your kids figure out what they should do. While not a game per se, one of my kids’ favorite things to do is to cook with me–and that is teaching them a great skill for self-reliance! Who doesn’t love a good family road trip in the summer? Use it as a time for practicing emergency preparedness skills. Look over the supplies you have in your emergency car kit and freshen them up! Use a map (instead of GPS) to find where you need to go (or have your kids do it). Play some of the games mentioned above while in the car. Turn off your electricity and then have dinner, play games, and sleep in sleeping bags in the same room! Show your kids it can be FUN (and find holes in your plans/supplies). You could step this up a notch and “camp” in the backyard as well! Your kids should know how to get home from various places around town. Take a family walk one warm summer evening and point out landmarks. Let the kids take turns trying to get home. You could also take a family drive somewhere and tell your kids to pay attention because you are going to have them navigate on the way home. Then test them! Can they get you home without help? See! 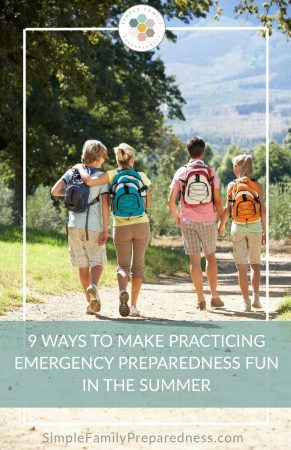 Practicing emergency preparedness can be fun–especially in the summer! 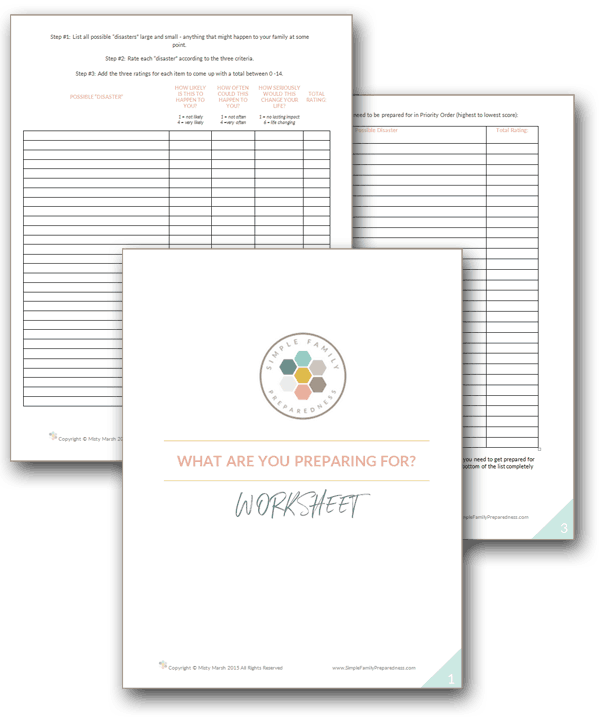 What have you done to practice emergency preparedness? How do you make it less “scary” for your kids? I’d love to have you share your ideas! If you liked this article, I’d love to have you share it! I’d like to share this for RS Evening meetings. These are great ideas! Thanks! Glad to know it was helpful Debbie! I am going to share this when I lead the discussion at church Sunday. Some fun ideas! Thank you. Great ideas. We are well on our way, but there are many really great reminders about things I need to make priority. Thanks! Great page with lots of information. I learned quite a bit and am glad I read this.